Bear Mountain in Danbury is the perfect spot for hikers and cyclists to not only enjoy a great area to get in their physical activity, but a great area to explore nature. With Candlewood Lake right next to the area, hikes and bike outings come with a gorgeous view of the lake as well. There are also plenty of chances to glimpse wildlife throughout the area. Sherwood Island State Park in Westport is Connecticut’s first state park and certainly one of its finest. More than 230 acres of park space provide hiker and cyclists plenty of land to cover along the beauty of Long Island Sound. Get too hot on the trails? Just mosey on down to the shore and take a dip to cool off. This 400-acre forest in Stamford is ideal for taking your bike out for an adventure into nature. The park presents visitors with a taste of everything from trails, rock formations, a wildflower garden, caves, and streams and wetlands. Visitors can take on 93 acres of serene landscape in Stamford at Bartlett Arboretum. With nine trails to choose from, there’s no shortage of hiking and biking space to be had. The Poorhouse Brook runs straight through the Arboretum allowing visitors to take a slow stroll along the water and hit the peddles across the park. The New Canaan Nature Center flaunts a diverse area of wetlands and trails across two ponds and two miles of trails that make up the largest tracks of open space in New Canaan. The trails are open from dusk to dawn and are free to use for the public. Visitors can hike and bike across the shoreline daily at Greenwich Point Park. With designated walk trails, those looking to keep their stroll quiet will have no problem enjoying the day. Devil’s Den Preserve in Weston is Connecticut’s largest preserve, coming in at about 1,700 acres and giving nature enthusiasts plenty to ogle at. 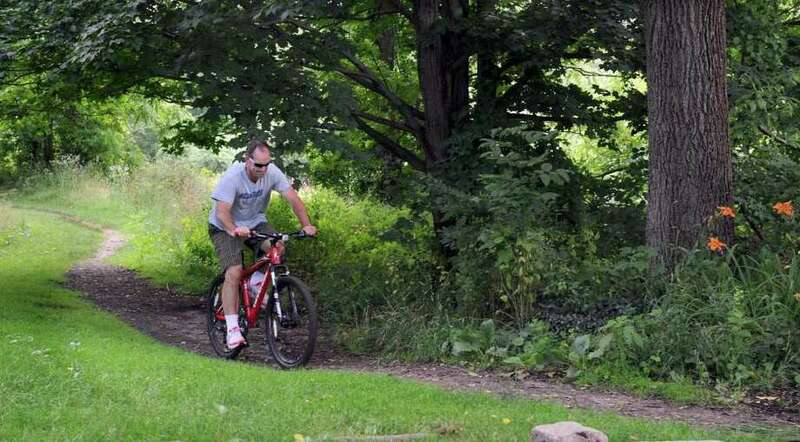 Hikers and cyclists can enjoy lush, wooded areas along the Saugatuck River, which is also part of the 70-mile Saugatuck Valley Trails System. With 16 miles of multi-use trails along Pequonnock River, this state park is ideal for hikers and cyclists alike. Visitors have the unique opportunity to explore land from the Long Island Sound up to the Pequonnock River Valley, traveling through a number of different parks from Bridgeport to Monroe. Visitors enjoy a lush landscape right along the Housatonic River, Stevenson Dam, and Lake Zoar. The park offers plenty of hiking and cycling trails and is rich in foliage to make your adventure all the more scenic. Hikers can hop onto the Paugussett Trail, which heads through Webb Mountain Park. Paugussett State Forest in Newtown includes both upper and lower trail sections that offer hikers and cyclists the very best in outdoor activities. Explore Lillinonah Trail in the upper section along Lake Lillinonah and the Housatonic River or the Zoar Trail along Lake Zoar against Oxford. This area is pristine for mountain biking and hiking for all skill levels. Seth Low Pierrepont State Park in Ridgefield gives hikers and cyclists beautiful scenery against Lake Naraneka to explore. There are plenty of overlooks to take in the sight of the lake and miles of trails to traverse.